Growing up, Elana had been exposed to nature and the splendour it holds. She has a deep love and appreciation for nature, wildlife and the outdoors. 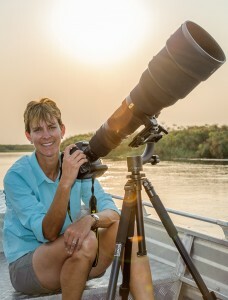 Photography had always been a keen interest, but between raising a family, running a business with her husband, Wouter, and life’s own priorities, it remained a dream.The dream became a reality when in March 2012 she joined Lou and Veronica on her first photographic safari to the Chobe River in Botswana. Equipped with her new found knowledge and enthusiasm Elana decided to travel extensively with different operators but came to realise that every time she works with a new Operator with different ideas and skill levels she as a photographer had to restart all over again. After serious consideration she decided that CNP Safaris was the one Operator that cared more about their client’s photography than any other. Since then CNP Safaris is her Wildlife Photography home and on the numerous safaris with CNP’s Lou Coetzer became Elana’s Mentor, pushing her constantly to do better. In the proses Elana’s Photographic and editing knowledge grew in leaps and bounds. Elana is gifted with a deep technical understanding of the physics of Photography and it’s application in a digital age. She is a dedicated Photographer who feels strongly about sharing her skills and experience with fellow Photographers. Elana believes that photography is a journey and whether you are just setting out or whether you think you have reached the finish line, there is always that ever elusive winning photo, a special sighting you have not witnessed before, a first specie not recorded yet, a story to tell or simply just a better image than the last. Therein lies the challenge and anticipation. If you want to grow as a Photographer, that finish line will always stay one step ahead. In 2015, Elana’s considerable photographical skills were rewarded with 4 Awards in the 2015 Natures Best Photography Africa Competition. This prompted CNP Safaris to invite Elana to become a CNP Safaris Tour Leader.